The Vactor 2100i combination sewer cleaner combines proven performance with a new level of operating simplicity that includes IntuiTouch™ controls and an optional RDB 1015™ rapid deployment boom. The Vactor 2100i combination sewer cleaner combines proven performance with a new level of operating simplicity that includes IntuiTouch controls and an optional RDB 1015 rapid deployment boom. The Vactor 2100i represents the latest in sewer cleaning technology from Vactor Manufacturing, Inc., which is currently celebrating the 50th anniversary of the introduction of the first combination sewer cleaner featuring water jetting and vacuuming. "Public works professionals and others involved in cleaning and maintaining sewers and catch basins recognize Vactor as the first name in sewer cleaners," said Sam Miceli, vice president and general manager of Vactor Manufacturing, Inc. "For 50 years, Vactor Manufacturing, Inc., has been at the forefront of developing combination sewer cleaners featuring innovative technology, user advantages and customized solutions. 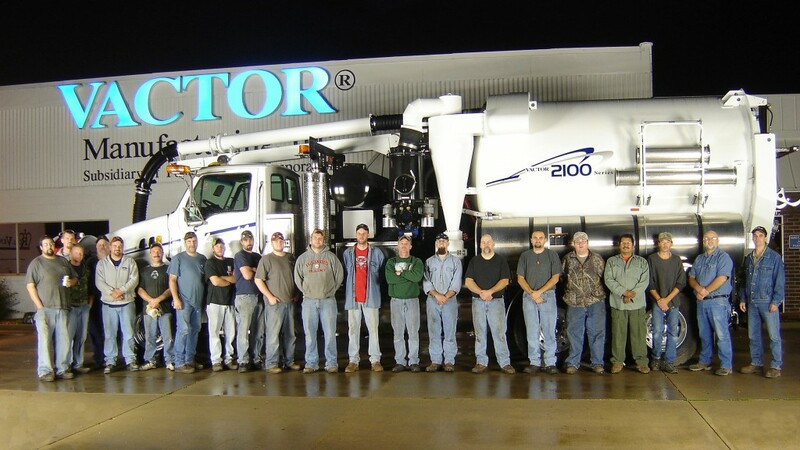 The Vactor 2100i is the latest entry in a long, distinguished line of industry firsts in sewer cleaning technology from Vactor Manufacturing, Inc."
Vactor Manufacturing, Inc., was originally founded in Chicago in 1911 as the Myers-Sherman Company, a manufacturer of pneumatic farm equipment. In the mid-1930s, Myers-Sherman moved its operations from Chicago to the community of Streator, Ill. Years later, in the early 1960s, the company began to design and manufacture a line of sewer and catch basin cleaners for the municipal market to clear clogged sewer lines and catch basins. The Vactor 2100 Series combination sewer cleaner was introduced in late 1989 and has evolved through continuous improvements, driven by customer needs. "Vactor 2100 Series combination sewer cleaners are the preferred products by many operators for both their intuitive design and ease of use," said Josh Malmassari, product manager at Vactor Manufacturing, Inc. "The series features the Modul-Flex design system that allows every customer to build a machine engineered to their specifications, on the chassis of their choice." Vactor Manufacturing, Inc., introduced the Vactor 2100i, a revolutionary combination sewer cleaner that combines intuitive simplicity and operational ease, at WWETT 2018. "As the successor to the popular Vactor 2100 Plus, the Vactor 2100i couples unmatched durability with enhanced ergonomics for complete operator comfort and effectiveness," Malmassari said. In 1969, the company introduced the combination sewer cleaner featuring water jetting and vacuuming. Pictured here is the Vactor Model 800 sewer cleaner. The Vactor 2100 Series combination sewer cleaner was introduced in late 1989, and has evolved over the years through continuous improvements, driven by customer needs. The popular Vactor 2100 Plus combination sewer cleaner has long been recognized by public utilities and professional cleaning contractors for unmatched vacuum performance, operator comfort and control, air routing and filtration efficiency, and fuel efficiency.